Are Egg Whites Really Better for You? Which part of the egg offers the most health benefits, the yolk or the whites? Lately there's been a big push to eat egg whites. The yolk part has gotten a bad wrap for a long time. Whites are high in protein and low in fat, and good for those of us trying to pack on some lean muscle. Plus, they are a great way to add some protein to a shake. The downside is you're missing out on a lot of the vitamins from the yellow yolk. It's fine to eat just the whites, so long as you're getting the other nutrients from different foods. 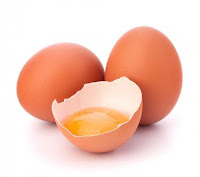 On the sunny side (sorry, had to do one egg joke) eating real eggs with the yolk also has health benefits. Studies have recently shown us that the cholesterol in egg yolks does not, in fact, affect the body’s level. Yolks are fine to eat. They also have more calcium, iron and vitamin A along with other nutrients," says Rona Lewis, Fitness and Lifestyle Coach. When you skip the yolk, you are skipping all the nutrients and good fats contained in it -- like omega-3s, Vitamin D, folate and calcium. For maximum nutrition, find a local egg seller that has free-range chickens. The more natural and varied diet (grass, bugs, etc) of the chickens packs the yolks with more vitamins and minerals," says food blogger Sarah Caron. Your best bet is to do 1 egg yolk to every 2 or 3 whites. So if you're making an omlette or scrambled eggs, crack one whole one, then only use the whites from the others. Toast up some whole grain bread and you've got a great meal.